Who are Law Firms Really Competing With and Why? Law firms are facing stiff competition when it comes to holding onto their clients, much less gaining market share. Given the flat growth in available legal work, law firms have been having to “steal” work from other firms to gain share. BTI Consulting’s Market Outlook and Client Service Review 2017 reports that while legal spending grew to an all-time high of $102.3 billion in 2016, the portion of U.S. spend on outside counsel remained relatively flat at $60.3 billion (it was $59.9 million in 2015.) On the other hand, in-house legal department spend grew by $4 billion, confirmation that law firms are competing as often with in-house legal departments as they are with other law firms. 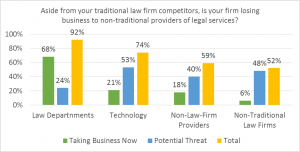 There is no question that the biggest overall threat to law firms now seems to be the continued growth of in-house departments, aided by the rapid emergence of corporate legal operations executives (see CLOC) and others who are focused on driving down the cost of legal services through the use of technology and greater efficiencies. This trend is likely to continue. Similar to the continued growth of in-house legal departments, non-law-firm companies continue to proliferate and expand. Chambers now includes these in their annual rankings and list in the top band: Axiom, Pangea3, QuisLex and UnitedLex. UnitedLex touts itself as “driving business impact” by offering a complete solution of technology, project management and subject matter expertise in litigation, contracting, IP and cybersecurity. “UnitedLex is a global leader in legal and business solutions. We are a company of over 2,000 employees – attorneys, engineers, financial analysts and consultants – operating throughout the United States and abroad.” It has partnered with seven law schools to host a legal residency program. This sounds like stiff competition to law firms, at least for certain types of work. In the meantime, other significant players in the field have been serving the needs of companies for years, gaining market share while in many instances doing so off the radar of law firms. 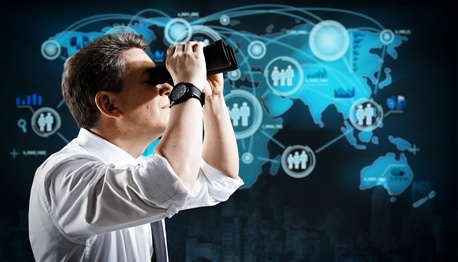 Consulting firms including those that provide investigations, compliance, forensics and data analysis, and data privacy and security services are hired by companies in areas that overlap legal services. Examples of these include the Mintz Group, Navigant, and Marsal and Alvarez to name a few. While many law firms have healthy and collaborative relationships with many of these consultants and are hired by clients to work together on matters, these consulting firms are also aggressively pursuing work they say they can do without such active involvement of a law firm. “In today’s complex business environment, organizations need more than just good lawyers. They need business savvy legal advisors. At KPMG, we understand the value of high quality legal counsel in complicated times. That is why KPMG firms focus on bringing together multi-disciplinary teams with deep local and international experience to tackle clients’ most challenging problems.” KPMG has over 1,200 lawyers operating in over 50 jurisdictions. How are These Competitors Positioning Themselves and Why are They Winning Work? Have globally recognized brands, invest substantially in original research and thought-leadership, e.g., surveys, white papers. There is no doubt that clients have an ever-broadening choice of legal service providers and many are providing clients with a more pragmatic, holistic approach and greater efficiency to solving business problems. In addition to having a less business-oriented mindset, lawyers and law firms in the U.S. are restricted in what they can do to combat these competitors that offer multi-disciplinary approaches and solutions. Despite what might be best for clients and for law firms, the ABA has, on several occasions since 1989, soundly rejected any efforts to loosen the regulations around lawyers and non-lawyers sharing profits and being in business together, or of outside investors helping to fund law firm growth and investments in technology and other solutions. In a future blog post, we will look at the ABA’s resistance to the multi-disciplinary movement and also how some law firms are trying to gain traction by offering services through consulting subsidiaries.